Commentators on the NPR program agreed that his proposal—though, like usual, lacked any fleshed-out details—hearkened back to Reagan-era policies. Trickle-down economics, as those of us who like to keep ourselves at least somewhat informed know, doesn’t work in favor of anyone but the already rich. It slows down economic growth, widens the income gap, and further harms those at the very bottom of the economic ladder. But it’s easy not to pay attention, to hear “less taxes” and cheer. It’s easy to forget what has already happened and learn nothing from the past. It’s also easy, with facts, articles, and knowledge on your side, to feel superior, to dismiss Trump supporters as ill-informed and be done with it. A lot of you have wondered why I haven’t commented on any of the recent incidents of racism and police brutality in America. The simplest response I can come up with is that I needed some time to think. I may be a minority, but I am not black. I will never be subjected to the very specific brand of prejudice inherent in both explicit and implicit acts of racism against black men and women in America. I needed to figure out, as Roxane Gay discussed in this article for Marie Claire, how to become more than an ally. I needed to figure out how to take on this fight in a way that addressed my own privilege; does not ask more of those who have nothing left to give; and does not further marginalize those who I’m trying to help. 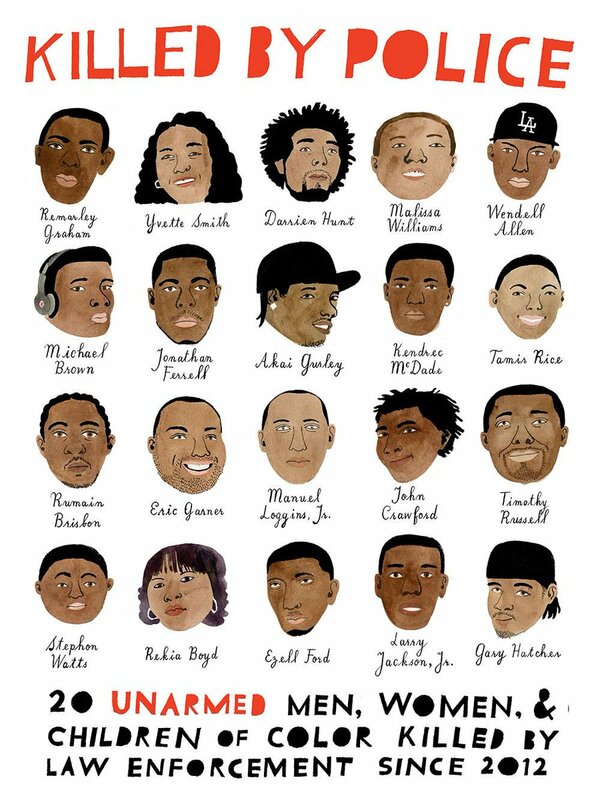 We’ve failed black men and women in America. In light of interpersonal racism and police profiling, this is fairly easy to see. But I think it is harder to understand how all non-blacks have failed them, and this is even more difficult to accept. When a black person is shot and killed, their bodies, like many black bodies before them, are objectified, politicized, and stripped of their personhood by news reports and water cooler talk from non-blacks. Their stories are repeated until all that’s left of Trayvon Martin and Alton Sterling and Philando Castile are observations and analyses of racial injustice and social struggles, and though often with the best of intentions, these discussions remain divorced from the fact that people—living, breathing human beings—lost their lives. So we continue to talk and analyze and squabble on Facebook about these matters. But, at some point, we forget and go back to our daily lives. We, as non-blacks, have the privilege to forget. We get excited for the latest Harry Potter book or the Olympics or some other funny thing on the internet. Meanwhile, our black brothers and sisters can’t afford to forget. The person behind the news story could easily be a relative or a friend. The person could be them. We’ve all failed black men and women in America. We’ve failed them in terms of systematic injustices, yes, but we’ve failed them even when we have every intention to help. As this piece by John Metta brings up, the inability to acknowledge our role within a racist system makes us just as guilty. (This article specifically calls out white people, but I would argue that this discussion extends to anyone who has enough privilege to only worry about a ticket when pulled over by the police.) Those of us who think of ourselves as socially conscious, as “woke” even, draw a line between us and them, between the “real” racists and the “allies,” even as we continue to benefit from a racist system and politicize, dehumanize, and co-opt these stories to produce outcomes that create little more than elevated chit-chat. We continue to forget that after awareness must come action. Voting. Writing to your local police chief or Washington representative. Calling out people on their implicit racism even though they may accuse you of pandering to political correctness. We continue to forget the people who have died as a result of this racist system, as a result of negative stereotypes and groundless associations as old as the country we live in. I witnessed a police shooting not too long ago. Two police officers were involved in an altercation with a black man. I’m not entirely sure what happened, whether the man genuinely posed a threat to the police officers or not. I’m not sure I’m even qualified to judge such a matter. What I do know is that a man ended up on a stretcher, bullet wounds on the side of his body, his white t-shirt soaked in his own blood. I know that even in the face of such an incident, even with the blood right in front of our eyes, the talk that surrounded the incident, even the words that came out of my own mouth, denied the victim of his personhood. Instead, our sorrow was expressed in platitudes, our analysis of the event purely political. Our words were no different than those we would have used if we saw this event on TV, or even simply heard about it in a passing conversation. We’re desensitized to such things. We are numb. Such incidents sadden and anger us at the time, but rarely do these sentiments last beyond a news cycle. They don’t shake us to our core, lead us to change how we act around police officers, how we act around strangers in general. We keep on keeping on, because we have privilege. Now let’s get back to Donald Trump. While his horrifying talks about nuking America’s enemies and dismissing Mexican immigrants as drug smugglers and rapists are enough to make one worry—to say the least—about his ability to serve as a diplomatic world leader, it’s his distinct lack of empathy, and the seeming popularity of this particular trait, that worries me the most. A lack of empathy leads a demagogue like Trump to categorically condemn all Muslims as one and the same. A lack of empathy leads thousands to cheer for such a condemnation. This again relates back to the subject of police brutality and systematic racism. Though there are certainly other factors that filter into such situations, a lack of empathy arguably plays a role in power relations between police and the public, preventing one from seeing the person behind the stereotype. And while abstraction as a way of thinking can lead to important realizations and a deeper understanding of the inner workings of various social tensions, a lack of empathy erases the human face from such political discussions, rendering the very reason for these discussions as irrelevant. It is simple to go through the exercise of absolving oneself of guilt regarding racial injustice if you consider yourself politically aware, socially conscious, even sensitive to racial issues. It is easy to forget the past, to overlook the fact that in retrospect, the blame for the tragedy extends beyond the perpetrator and involves the onlooker, the witness who saw, who pitied, who understood, but still did nothing. True empathy should compel one to act. We already know that we will never fully understand nor experience the systematic injustice that black men and women are subjected to in this country. But if we say that black lives matter, what are we going to do about it? Stay tuned for a list of reading material to aid in thinking critically about these issues, personal stories to remind you of why this really matters, and most importantly, resources to guide you in doing something about all of this.